Walking seems like such a simple activity: put one foot in front of the other and repeat. And walking is simple–except when I try to be mindful while doing it. A proven stress-buster and happiness-booster, mindfulness involves centering yourself in the moment, rather than, say, replaying that argument you had with your spouse about a million years ago. According to psychotherapist and former Buddhist monk Donald Altman, in his wonderful little book One Minute Mindfulness (2011), “To be alive is to totally and openly participate in the simplicity and elegance of the here and now.” Since being alive is something I’d like to experience a lot more of before I die, I’ve been working to incorporate more mindfulness into my daily routine, particularly the regular country walks I take with my canine walking buddy, Daisy. Though I’ve been happily walking the same rural roads near our farm for 25 years now and have never, ever found this to be boring, it nonetheless too often feels as though I’m operating on auto-pilot. Eyes open, yes, but not really seeing. Ears functional, sure, but not really hearing. Mind engaged, but leaping around like a pygmy marmoset that just chugged a triple-shot venti-mocha. From fuming about trash dumped in the ditch to worrying about my loved ones, from formulating that day’s to-do list to composing my next article: my busy mind never seems to sit still and just let me be. Yes, mindfulness is hard, and it takes constant practice–as anyone who has attempted (and repeatedly failed) to adopt a regular meditation habit can attest (me!). But as I walk, and walk some more, I’m slowly learning to send those pesky intrusive thoughts floating away like leaves on a lazy stream, slowly learning to gently return my attention to the present, slowly learning to spare myself criticism when I fail at both of the above. And it is so worth it, attending mindfully to the things I might otherwise have missed. Like hearing the raven’s silence-shattering croak and the pleasant murmur of water in the rain-swollen ditch. Like smelling the fading autumn fragrance of crushed leaves and the Christmas-is-coming scent of Douglas fir. Like feeling the cold air bite my fingers, the sun warm my face, the Earth solid and reassuring beneath my feet. 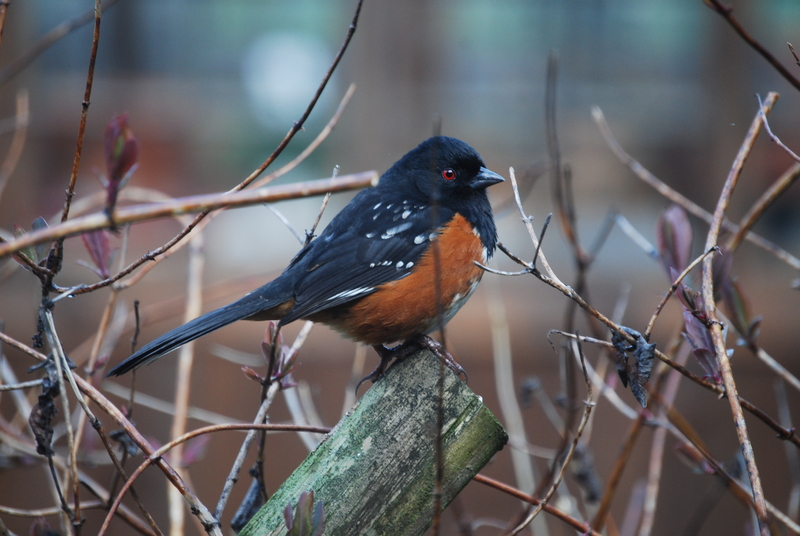 Like seeing the spray of crimson rose hips, the snow sugar-sprinkled on fireweed stalks, the towhee spying on me with ruby eyes, the two bald eagles circling against a forget-me-not sky, the car driftng in my direction (yes, mindfulness can even save your life). I return home refreshed, relaxed, revitalized. And I can’t wait for my next (mindful) walk. Have you tried bringing more mindfulness into your life? If so, how? And what happened? I have severe “monkey mind,” as it’s called in yoga. I got into two big wrecks with my young horse, and both were because I was not paying attention to him–not being at all mindful. In one of my accidents, the bridle broke, and I still have a small piece of leather from it to remind me to slow down and be more mindful! Thanks for commenting, Lisa. I’ve also learned the hard (and painful) way how important it is to be mindful around horses! Thanks for the reminder to be mindful! I find I’m most content when I make a point to experience the “simplicity and elegance” of the moment, but I often let my head drift to other places. Walking in general is such a great way to get around–even in the city. You can connect directly to your environment (literally, through your feet) and you just can’t do that when you’re driving. Mindfulness is not easy but we’ve been trained for distraction, not attention so we really have to work at it. Thanks for bringing up this important topic!